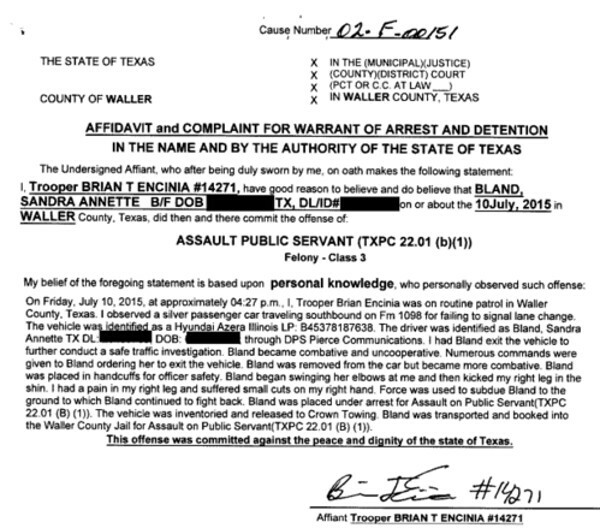 In the Affidavit and Complaint for Warrant of Arrest and Detention the affiant (Trooper Encinia) affirms that Sandra Bland committed the crime of Assault Public Servant, a Class 3 felony, and that he personally witnessed the offense. This is the part he feels comfortable about putting out there, and the part that has to be convincing to make the charge stick. He has to say she injured him, and it hurt. That’s the sign, the tell. His actions that he knows were wrong are in the passive voice, as if he had nothing to do with any of it, no causal connection with the giving of commands, or the removal from the car, or the handcuffing, or the use of force. The only thing he personally admits to is being kicked and having an owie on his hand. What a joke! 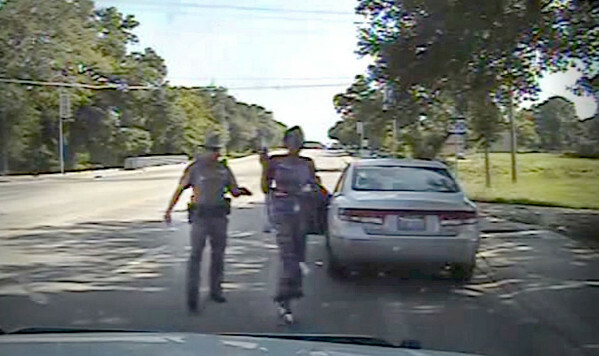 The only offense in that situation was committed by a cop who took a piddling traffic stop – that supposedly was going to result in only a warning! – and deliberately, diabolically turned it into a violent and decidedly undignified fracas. This entry was posted in Abominations, Folly, Law, Racism, Sandra Bland, True Crime. Bookmark the permalink.